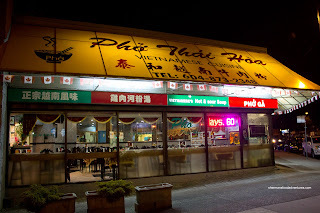 In Vancouver, there are a few Vietnamese places open real late into the early morning hours. I say a "few" because there aren't as many as one would think considering the plethora of these places. As such, the only ones open at these hours are all of the Pho Hoa locations and a few others. As much as I don't mind Pho Hoa, it is not exactly my first choice when it comes to Vietnamese grub. As for the "others", nothing has made me classify them as must "eats" either. So when we had a game that ended at a more reasonable hour for our Friday night league, we headed over to one of the "better" Vietnamese restaurants in town - Pho Thai Hoa. "Better" because it earned the silver in Vancouver Magazine restaurant awards (if that had any influence on our decision to eat here). We barely made it since the place was due to close at 10:00pm. As such, many of their menu items were unavailable except for the basics. Gordo and Sweet Tooth ended up sharing the Spring Rolls to start. If you take a gander at the picture, you'll clearly see that they are prepared with rice paper wrap. That in itself is a good start. The use of rice paper gives the spring roll a totally different texture and appearance. This one was done very nicely being crisp, light and with a filling that was flavourful. Due to the limited items available, Milhouse settled on a Grilled Chicken Banh Mi. The bread was slightly dense while still crisp from the toasting. Nestled within the typical ingredients such as pickled daikon and carrots, cucumber and cilantro was moist and tender chicken. 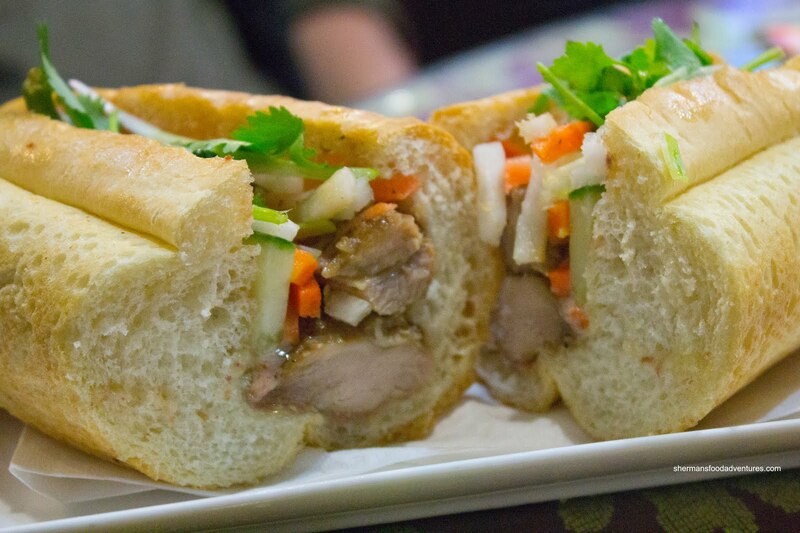 It was flavourful and was more than enough to give the whole sandwich some punch. 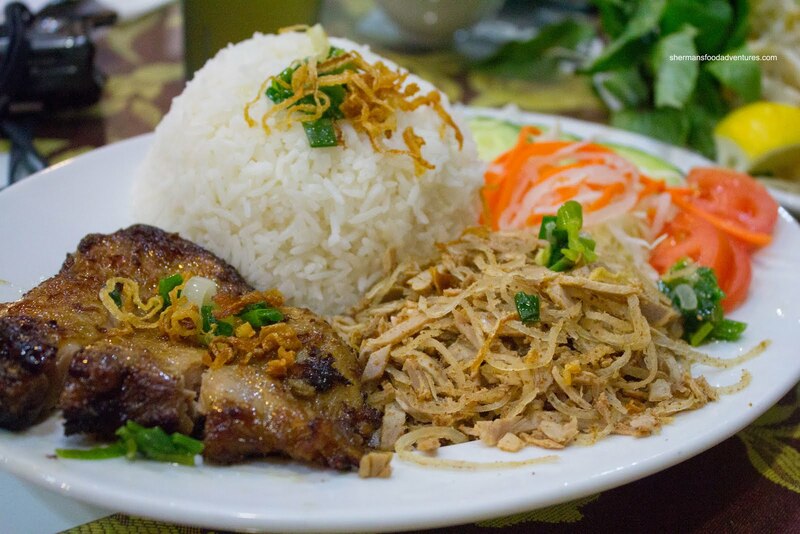 Gordo ended up with the Lemongrass Chicken and Shredded Pork (pork rind) with rice and it was expected to be good since the meat would be exactly the same as the one found in the banh mi. So yes, it was moist, juicy and full of flavour. Loved the colour of it too. 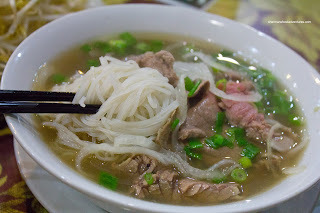 For myself, I had a banh mi as well and a bowl of Pho. Hey, I can't eat only one item right? Unlike some other Vietnamese joints, the pho here looked like there was some care exercised in its preparation and construction. The noodles were not clumpy and perfectly al dente. Moreover, the meats were sliced evenly and were tender. The broth had a pleasing colour and was neither too salty nor too light. It was more on the savoury side than sweet though. I would say this was an above-average bowl of pho but still doesn't compare to my personal favourite at Pho Tam in Surrey. Yet, what I can say is the food that we tried here at Pho Thai Hoa was solid and reasonably-priced to boot. 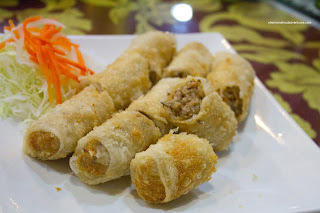 In a sea of Vietnamese restaurants on Kingsway, it is hard to find significant differences sometimes. Well, we could tell that this was a notch higher than the usual.